If you have multiple web servers running HTTP, you can offload the HTTPS SSL function to a hardware load balancer, which will do both the functions of load balancing the traffic between the nodes, and performing the HTTPS. In this tutorial, we’ll use the following example, where node1 and node2 both runs only HTTP. The HTTPS is offloaded to Big-IP F5, which will also do load balancing. First, you should have a SSL certificate and key generated for your site. Once you have that, upload it to the F5 as shown below. Certificate Source: Select “Paste Text”, and paste the content of your SSL certificate here. Once you import the certificate, you should also import the key. Go to Local Traffic -> SSL Certificate List -> You should see the certificate you just created here (i.e devdb). 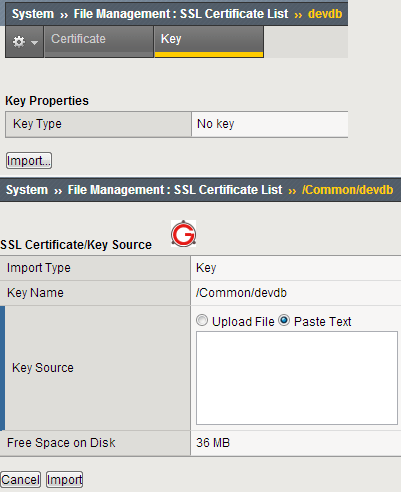 Select the certificate, and click on the “Key” tab on the top, which will display the following screen. Click on Import here. KeyName: This will display your certificate name. Key Source: Select “Paste Text” radio button, and paste the content of your key here. Now, if you go to “Certificate List”, you’ll see the “devdb”, but under the “Contents” column it will say “Certificate and Key”, which indicates that you’ve uploaded both certificate and key. Note: If you are still using older version, upgrade Big-IP F5 Software to new version as we discussed earlier. Parent profile: Leave it default at clientssl. If you have a passphrase to enter for your key, you should do it here, by selecting “Advanced”. If not, just “Basic” information is good. Passphrase: The passphrase for the SSL key. Leave all other fields default. After you create the SSL certificate/key, and SSL profile, it is time to create a pool, and assign members to it. Go to “Local Traffic” -> Pools -> Pool List as shown below. Name: Enter the pool name. For example, devdb-pool. Health Monitors: Select “tcp” from the “Available” list. New Members: Click on “New Node” radio button, and enter the ip-address of the node1. Add: Click on add to add the node1. Repeat the same process and add “node2”. 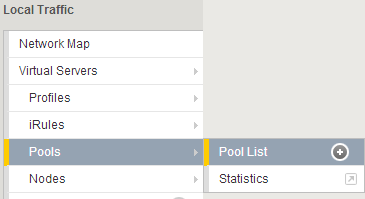 Once you’ve added both the nodes, click on “Finished”, which will create this new devdb-pool. Finally, it is time to create the HTTPS virtual server that will use the pool we created above. Go to “Local Traffic” -> Virtual Servers -> Virtual Server List as shown below. Destination: Select “Host”, and enter the name of the virtual server. (For example, 192.168.102.2). So, if someone comes to 192.168.102.2 on SSL, it will get redirected to one of the nodes in the devdb-pool. 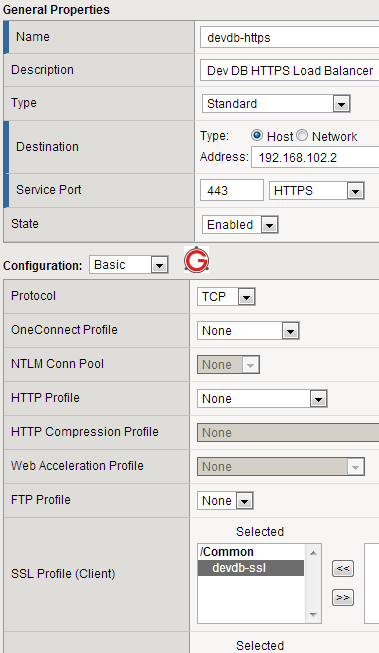 Service Port: Select HTTPS, as incoming request to the virtual server itself will be in SSL. 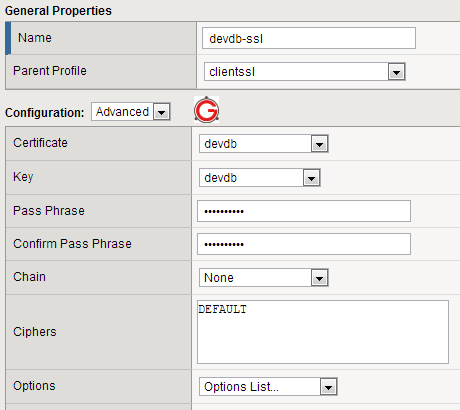 SSL Profile (Client): select “devdb-ssl” from the list. Leave everything else default on this screen and create the virtual server. After the above setup, If you go to https://192.168.102.2, F5 Big-IP will do the SSL encryption and transfer the traffic to one of the HTTP nodes. In F5, can I do just the load balancing without HTTPS offloading? Also, does it support any dynamic addition/deletion of nodes based on some custom logic. 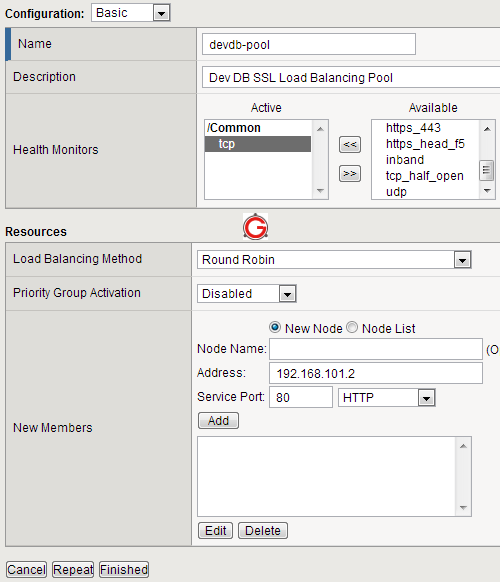 For example, I want to add 6 nodes to the load balancing. But, only 5 should be active at any given time. The 6th one should become active only if any one of the 5 nodes fails. I read your paper all 245 paper from 2011/5. How can I set this up? Please help. Ramesh Excellent Article, Thanks For Posting. Thumbs up but I would like to ask what about load balancing application that require unicast mode?